A group of conservationists is breeding lions in the Southern African nation of Zimbabwe in an effort to stave off possible extinction as humans and these great cats fight for land. At the Antelope Park Farm in Gweru, the main business is lion breeding. The African Lion and Environmental Research Trust - ALERT - has more than 100 lions in the program. Gary Jones, who heads Antelope Park Farm, said ALERT has stepped in because of a drastic drop in the lion population, caused mostly by the biggest predator of all: humans. Human population growth has hemmed lions into ever-smaller territories. �The wild population of lion has plummeted from about 250,000-260,000 - 30 to 35 years ago - to a current estimate of ranging between 18,000 and 30,000 or 32,000. So you can see the numbers have declined horribly. It comes through human population growth. So the future of the lion is looking very bleak at the moment as humans encroach into their natural environment as our population expand,� said Jones. Antelope Park Farm is one of two sites ALERT has set up in Zimbabwe. Another site is in Zambia. Jones said the drop in the lion population affects the entire ecosystem, and he said other African nations are seeing the disastrous effects of this. �There are countries in central and North Africa where the lion population has reached critical levels. Burundi, for instance, do not have lions whatsoever in their national parks," said Jones. 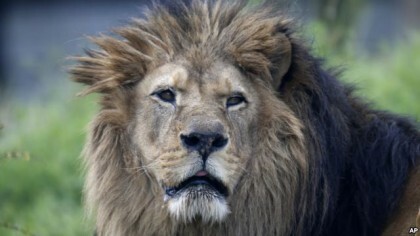 "They are very, very desperate to have lions reintroduced into their national parks. Because when you take the apex predator [lion] out of the equation, certainly you get all funny things happening with the balance of nature. You get overstocking of these prey species. You get diseases coming through into these prey species; that is exactly what is happening in Burundi,� he said. The United Nations� Food and Agriculture Organization - FAO - says wild animals are threatened when farmers try to protect their plants or livestock from predators. Rene Czudek, an FAO official responsible for wildlife and forestry in southern Africa, said his organization has come up with a human-wildlife tool kit that some African countries are using to reduce conflict between humans and wildlife. That way, FAO hopes conflict between humans and wildlife is reduced, and that these threatened species can again flourish.